I have to admit that this is a better film that I expected, better than the previous efforts of both starring senior citizens to collect some pocket money for their pension fund. Of course you only need the title of the film to know exactly (exactly!) how this will pan out from beginning to end, it does so with a straight face and little embarrassment. Stallone and Schwarzenegger (in particular Schwarzenegger) both try to avoid too much physical stress, going for the slower movements and more remote ways of offing their opponents. Those opponents stand in the way of bringing back justice, and justice is restored at some point. 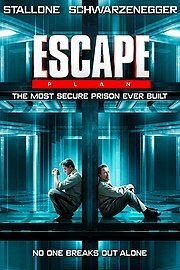 The prison is well designed with a futuristic look to it, Schwarzenegger does not need to talk so much, and not a single surprise or twist stands in the way of figuring out and executing a, yes, escape plan from the super-maximum security prison. Jesus plays along (Jim Caviezel), as does Vincent D’Onofrio, so there are even some former actors involved in the cast.